The reason for our visit to this toasty town was an outing of the Chardonnay Travelers, our chapter of the Winnebago-Itasca Travelers club. 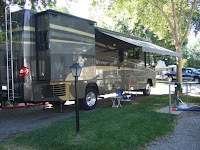 Our home for the weekend was the Almond Tree RV Park, a very lovely and friendly park that we highly recommend. (But, please, come when it's cooler!) This was a very special weekend for us, as it marked the first anniversary of our chance meeting with these good people on the day we took delivery of our moose. It's also the last outing we'll be able to attend for quite some time, as Bullwinkle's Travels will be taking us far and away for awhile. As always, we enjoyed the fun, food and great conversation that comes with spending a weekend with these good people. We look forward to seeing them somewhere down the road and wish them all safe travels. There are lots of things to do in Chico. And, someday we'd like to do them. 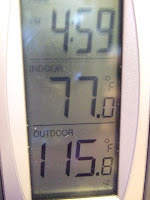 But, when the temperature soars over the century mark, the best thing to do is chill. And, that's exactly what we did. We're home again, but not for long. Much more to come. We're back home after our few days in the mountains. As we left the campground, we made our what seemed like thousandth trip down the road to Shingletown. As we approached "town" for the last time, we snapped a quick picture. As you can see, this booming metropolis is really nothing more than a wide spot in the road. But, to us, this closest spot with cell service, served as our vital link with the civilized world. When you're camping in the mountains, the must-see sights can be rather far away. 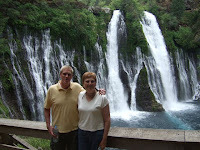 On this gorgeous day, we stretched our road tripping to a 100-mile round trip to McArthur-Burney Falls State Park. The centerpiece of the park is the 129-foot Burney Falls. We hiked down to and up and around the falls, shooting many pictures along the way. It was one of those places where people take pictures of each other. A lovely couple took this picture of another lovely couple. Burney Falls is fed by Burney Creek. 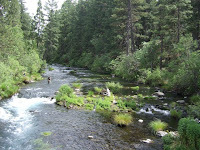 As we crossed the bridge over the picturesque creek, we snapped a picture. The 1.5-mile hike was a great way to spend the afternoon as we exercised our bodies and our shutter fingers. 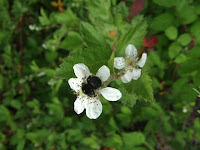 Once again, our attention was drawn to big things, like the falls, and the small things in the park. This bee was very busy this afternoon! Was this far away spot worth a long drive on a beautiful afternoon? Absolutely! We wandered far from our cozy campground today and made a 65-mile road trip to this beautiful spot. 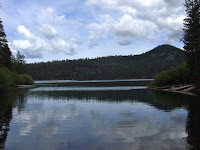 Butte Lake is located in the Northeast corner of Mt. Lassen Volcanic National Park. The volcanic remains appear to "spill" into the lake. 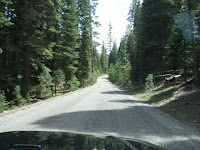 Our Jeep Rocky really enjoyed the trip down Butte Lake Road, a six-mile gravel road that winds through the forest and sometimes feels more like a washboard than a road. We had a very good reason for making this long and rough drive. 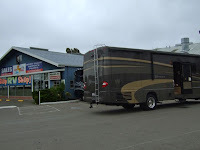 We came to see Marty, our fulltime RVing friend we caught up with in Sacramento earlier this year. 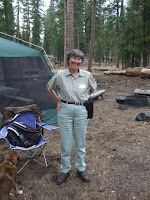 She's serving as a camphost at the Butte Lake Campground. (Doesn't she look official?) This campground is as gorgeous as it is rustic. No hookups for campers and it's many miles to anything that begins to resemble civilization, which explains why we were just visiting. 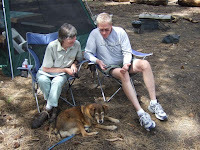 We sat in this beautiful rustic campground and caught up. P spent a minute showing Marty his new iphone. The funny thing about this picture is we were miles and miles from cell service. So, at this location, this little apple was pretty much a paperweight. 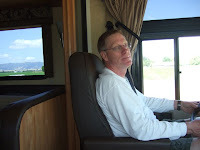 After a couple of hours of great conversation, we left Marty to do her afternoon rounds and we headed back to our campground, with new appreciation for our full hookups. We look forward to seeing this special friend down the road. We love to camp in the near-wilderness. 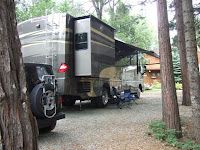 Give us a quiet campground in the woods - with full hookups, mind you - and we're happy campers. Until we need to use the phone. Today was one of those days when it just so happened we needed to make several phone calls. And, what did that take - out here in the wilderness? Well, with absolutely no bars here, we had to hop in the Jeep and drive five miles into "town" where we found decent cell reception. And, guess what? We did it more than once. About the third time in the day we loaded up to make the trip into town to make a call, P summed it up best. "It's like we have to climb the telephone pole to make a call." That brief and powerful recollection harkened us back to a prime time family sitcom of our youth: Green Acres. 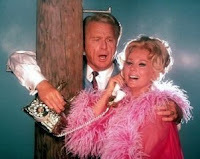 Whenever anyone at the Douglas estate just outside Hooterville needed to make a call, they had to hop out the bedroom window, climb a telephone pole, hold on for dear life and make a call. That was sitcom life in the late '60s. Today, we experienced that feeling in real life in the 21st Century. From here on out, we're thinking our camping might just have to be a little less remote. We have a knack for choosing inclement days to visit the most spectacular vistas. Such was the case once again as we ventured up the road to Mt. Lassen Volcanic National Park. With plans to pick up a National Parks Annual Pass, take a hike, enjoy a picnic and spend the afternoon exploring the park, turns out our we were able to accomplish just half of our mission. With our shiny new park pass in hand, we stopped just inside the gate at Manzanita Lake. 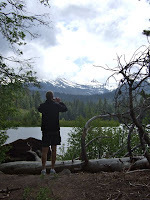 The two-mile perimeter hike offers stunning views of the park's snow-capped peaks. We tried to capture as many as we could along the way. Each time a peak would peek, we'd stop and shoot. Looks like P got a good shot! Even on this cloudy day, the views were lovely. We'll try our best to make another trip when the sun is shining. 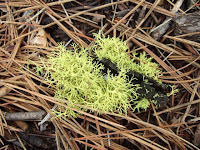 While most of the views were up, we enjoyed looking around the lake and the forest floor, where we admired the beauty in some very small things. 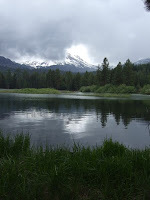 As we came off the trail, the skies opened up and the rain began to pour. (What timing!) With no signs of a break in the weather, we headed back to the moose to enjoy our picnic lunch. With a promise for better weather in coming days, we'll definitely be back. Greetings from the Shingletown KOA. We've settled in here for a few well-deserved days of rest and relaxation. This is another KOA that is out of the ordinary. It's located about 20 miles from Mt. 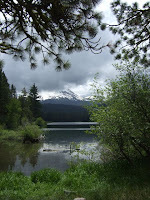 Lassen National Park, and is tucked away in a forest of tall ponderosa pines, firs and aromatic cedars. It's very well maintained and staffed with some very cheerful folks. This is exactly the kind of spot we like: we have all the modern conveniences in a place that feels like a rustic campground. 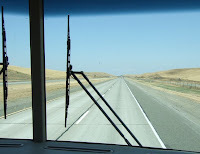 We arrived yesterday after an afternoon on a few California freeways. Along "the 505" (as our friends from Southern California would call it) between Allendale and Winters, we were struck with how "boring" the scenery had become. We've heard people complain about how boring a drive across our native state can be. Well, folks, this picture proves that Northern California can be more boring than Western Kansas! With the boredom behind us, we caught glimpses of snow capped mountains as we moved north. (Much better!) We arrived safely in Shingletown by 4:00 PM and were set up in minutes. We relaxed under the shelter of our awning as a few widely scattered thunder showers passed our way. The intermittent showers continued through the night, lulling us to sleep. Today, we enjoyed a very lazy morning lounging around our campground. After lunch, we headed out for a brief exploration of the booming metropolis of Shingletown, where the altitude (3700 feet) outnumbers the population. 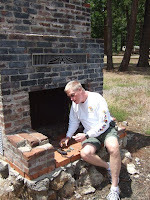 We picked up a few geocaches along the way. 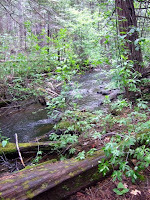 This creek ran along side a very nice rest area nearby. And, yes, there's a cache there. Our caching took us for a little walk in the woods. 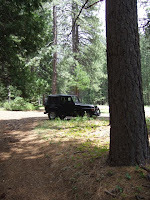 Here's our Jeep Rocky looking very at home amongst the tall trees. What on earth is this guy doing? He's finding another cache. 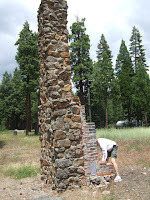 This one was in the remains of a once popular Shingletown watering hole. 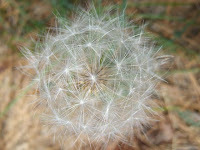 In between the caches, I spotted this perfect dandelion gone to seed. I had to capture it! 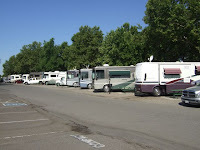 On this Friday afternoon, we've seen a steady stream of new arrivals as our cozy campground is expected to fill up for the weekend. The biggest task ahead of us yet today is to decide what's for dinner. And, with light rumbles off in the distance, it sounds like we could have another night of peaceful sleep to the pitter patter of rain on our fiberglass roof. We made it home a week ago yesterday. But, Bullwinkle spent the last week at the "hospital" in Petaluma. After a long weekend of fun, relaxation and some successful geocaching, we dropped the moose off last Monday morning for some routine service and a bit of warranty work. He was released today, though he'll have to make a return visit when some special order parts come in. We ran up in the Jeep to pick Bullwinkle up and take him to his home. The cats came along for the ride. Were they ever confused! We put them in their crates and loaded them into the Jeep. They know this drill: We were going camping! They are well-accustomed to the 20-minute drive to the moose. About 30 minutes into our hour-long drive today, one of them started complaining. We had exceeded his limit in the Jeep! When we arrived in Petaluma, we hooked the squirrel to the moose for the ride home. 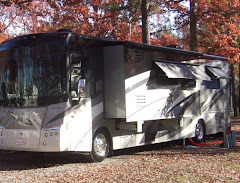 We parked the cats in the motorhome and they settled in for what they surely thought was a ride to a campground. When we pulled into the storage facility, we stopped to unhook the Jeep, and the cats had that look they get when we pull into a campsite. Just about the time they were ready to hear the jacks go down and the slides come out, we picked up their crates and deposited them into the Jeep. Twenty minutes later they were home again. You could see it on their furry faces: "Say WHAT?" No, this is not how a camping trip is supposed to go. But, we promised we'd take them on a real trip soon. Very soon!